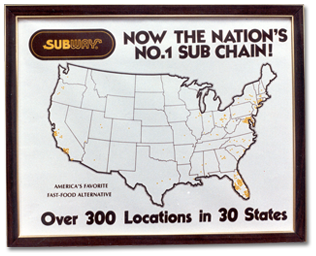 How did the SUBWAY® chain start? Where did it all begin? 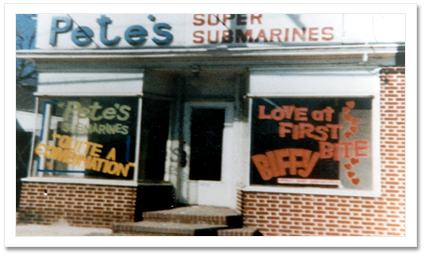 A recent high school graduate, 17 year old Fred DeLuca, and family friend Dr. Peter Buck team up to open their first submarine sandwich shop in Bridgeport, Connecticut. 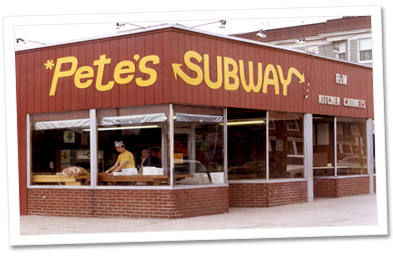 Originally called “Pete’s Super Submarines,” they sell 312 sandwiches the first day. 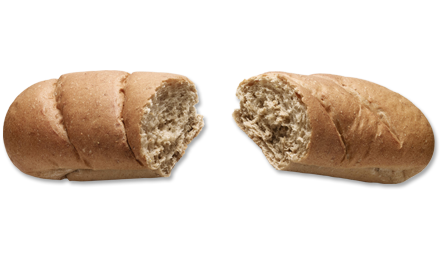 The average cost of a sub was between 49 cents and 69 cents. Partners DeLuca and Buck form Doctor’s Associates Inc. 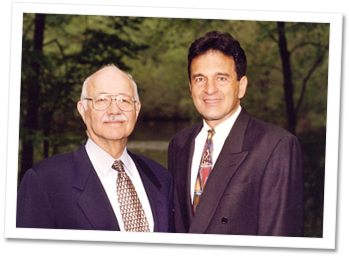 The name is derived from Dr. Buck, who holds a Ph.D., and the fact that DeLuca hoped to earn enough money in the sandwich business to pay his college tuition and eventually become a doctor. DeLuca and Buck decide that franchising is the best way to kick-start the chain’s growth. 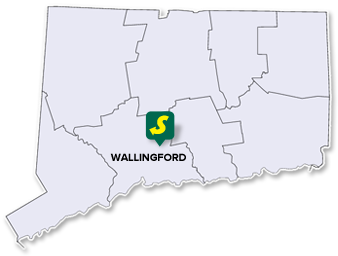 The first franchised SUBWAY® restaurant opens in Wallingford, Connecticut. 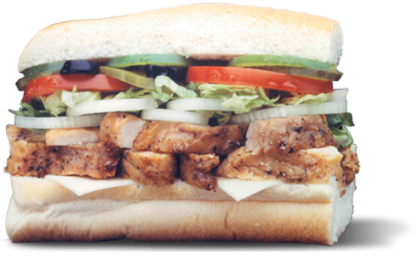 The chain’s flagship sandwich, the classic BMT, is first introduced. 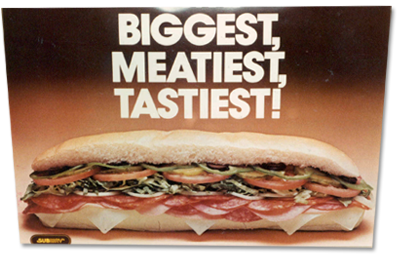 It is named for the Brooklyn-Manhattan Transit system, but later it is referred to as “Biggest, Meatiest, Tastiest,” in advertising campaigns. Also this year, the first SUBWAY® restaurant located outside of Connecticut opens in the state of Massachusetts. 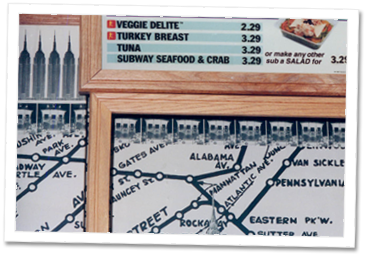 The SUBWAY® chain introduces its New York City transit system themed mural as a décor item in a restaurant in Ithaca, New York. 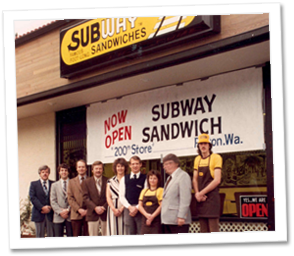 The development of the SUBWAY® chain picks up, with the 200th restaurant opening in Renton, Washington. 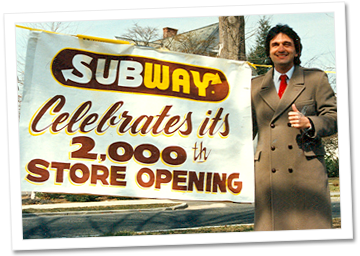 In just one year, the SUBWAY® chain opens an astounding 100 restaurants, with the opening of the 300th location. 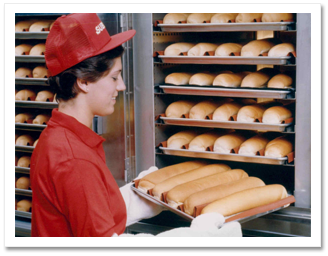 SUBWAY® restaurants introduce freshly baked bread at U.S. locations. People begin to notice the remarkable growth of the chain since the first shop opened, with Entrepreneur Magazine® ranking SUBWAY® restaurants “Number One” in the sub sandwich category for the first time. The chain ventures into the international arena and opens in the Middle Eastern nation of Bahrain. Party Platters and the SUBWAY® Club sandwich are introduced. The SUBWAY® restaurant chain celebrates the opening of the 500th unit, and the opening of the first restaurant in Puerto Rico. Steak and Cheese and wheat bread are added to the menu. 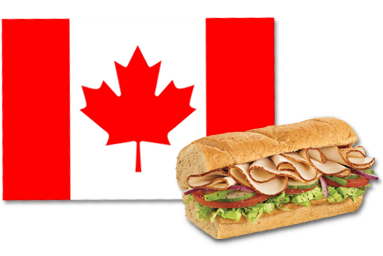 The neighbors to the north now can enjoy everyone’s favorite submarine sandwich, as the SUBWAY® chain opens its first Canada location in St. John’s, Newfoundland. 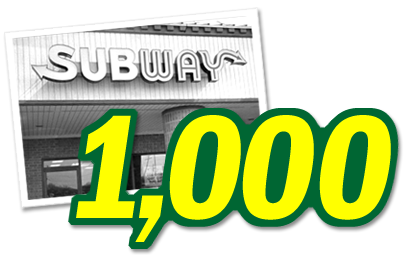 Continuing to grow at a rapid rate, 1,000 SUBWAY® restaurants are now open. This year, the chain opens its first locations in the state of Hawaii and in the Bahamas. Aloha! The Cold Cut Combo is introduced and the chain’s 2,000th location opens. 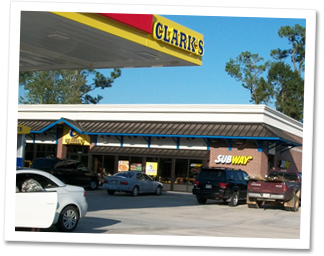 Entrepreneur Magazine® lists the chain as the number one franchise opportunity for the first time in their annual Franchise 500 ranking. 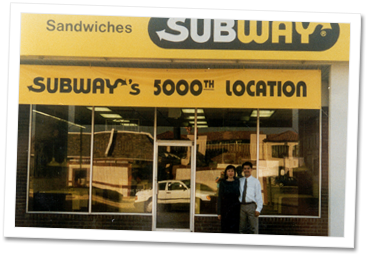 The SUBWAY® restaurant chain reaches its goal of 5,000 restaurants with an opening in Texas. The first SUBWAY® restaurant opens in Mexico. Students begin to enjoy SUBWAY® lunches in school cafeterias, as the chain participates in its first school lunch program. 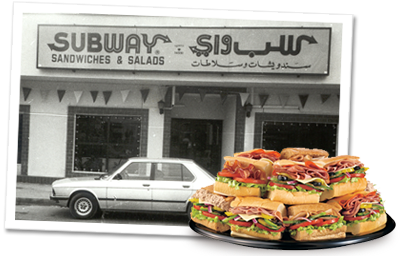 This year, the first SUBWAY® restaurants open in Japan and Saudi Arabia. 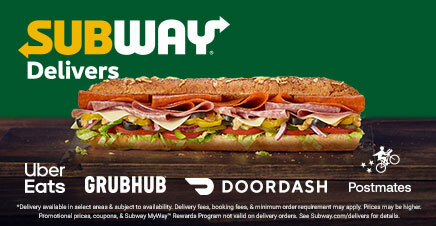 The SUBWAY® website, www.subway.com officially launches. 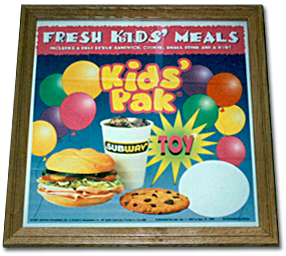 The motion picture, “Happy Gilmore” features numerous scenes at a SUBWAY® restaurant. International expansion booms, with SUBWAY® restaurants arriving in Colombia, Denmark, Guatemala, Kuwait, Martinique, Nicaragua, Philippines, Singapore, South Africa, Turkey, United Kingdom, Uruguay and Venezuela. 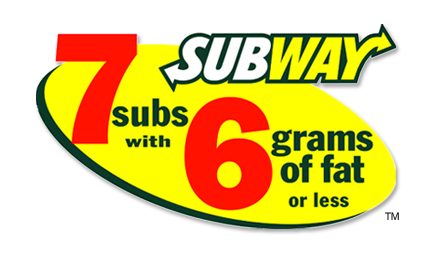 Centered around fresh, better-for-you sandwiches and salads, the brand introduces the 7 under 6™ menu, featuring seven sandwiches with 6 grams of fat or less. 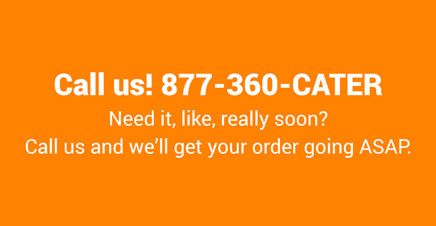 SUBWAY® restaurants can fit just about anywhere, from airports to zoos. 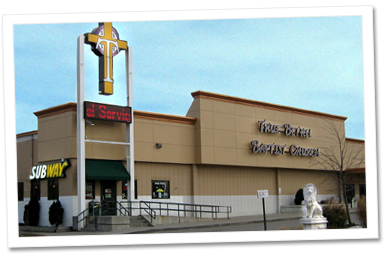 This year, the True Bethel Baptist Church in Buffalo, NY opened a SUBWAY® restaurant. The franchisee, who is also the pastor of the church, uses the restaurant to teach job and professional skills to underprivileged youth in the community. 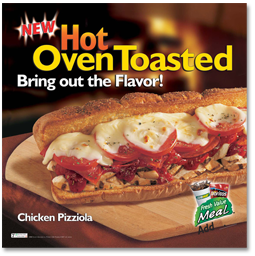 Toasted subs are introduced, a welcomed new option by customers looking for a warm, melty sub. A SUBWAY® restaurant opens at the South Carolina regional headquarters of Goodwill Industries. The restaurant is part of a program dedicated to helping people with barriers to employment learn the skills needed to better provide for themselves and their families. The first SUBWAY® Eco-Restaurant opens in Kissimmee, Florida to incorporate more environmentally responsible operations and to introduce the chain’s Eat Fresh, Live Green™ initiative. Eco-elements include low-flow faucets, energy efficient equipment, and solar tubes for lighting. 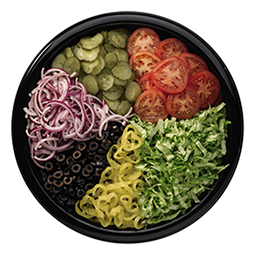 The SUBWAY® chain launches its Fresh Fit® and Fresh Fit for Kids™ meals. 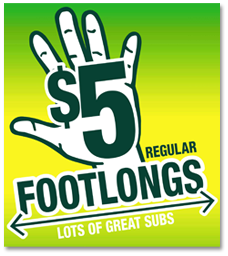 The SUBWAY® brand introduces its long running $5 Dollar Footlong™ promotion. 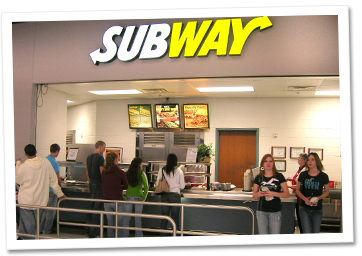 The 30,000th SUBWAY® restaurant opens. 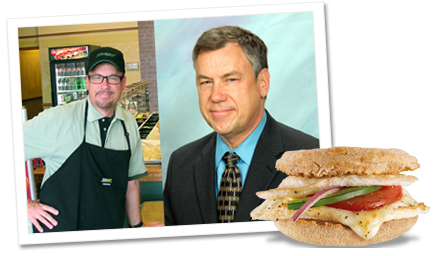 The brand’s Chief Development Officer goes undercover on the hit TV show, “Undercover Boss.” Customers can now rise and shine with SUBWAY® restaurants, with 25,000 locations throughout the U.S. and Canada introducing the brand’s new national breakfast offerings. Options include a variety of sandwiches and melts, with the choice of egg whites or whole eggs, veggies, toppings, and sauces. With more locations than any other restaurant chain worldwide, the 35,000th SUBWAY® restaurant opens, including the 8000th non-traditional SUBWAY® restaurant. The chain receives the first ever “A” in the Eat This, Not That! Restaurant Report Card, as well as top honors from Zagat. Five more Eco Restaurants open, bringing the total up to 14, with other locations incorporating eco elements. 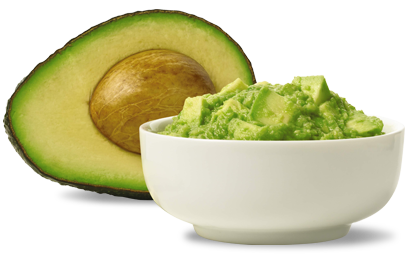 Super food avocado is introduced to the menu. Lots of people are talking about SUBWAY®, as the brand receives recognition as the “Most Loved Fast Food Chain in the US” by YouGov’s BrandIndex Buzz Rankings. 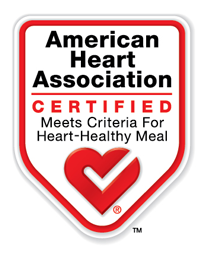 In June, SUBWAY® restaurants is the first quick service restaurant to receive the American Heart Association’s Heart Check Certification on a number of menu items and meals. SUBWAY® restaurants are now open in 100 countries. 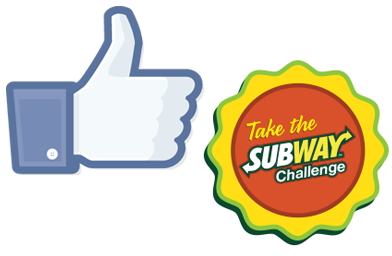 The SUBWAY® Facebook page reaches 20 million fans in January. 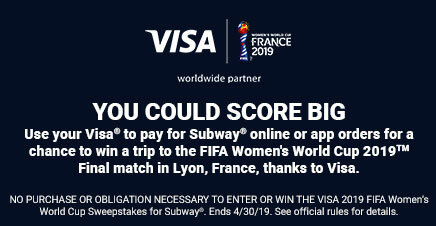 At the end of January, the Build Your Own Virtual SUBWAY® Challenge launches globally in 100 countries to inspire young entrepreneurs about owning your own business, with potential career opportunities with the SUBWAY® franchise. 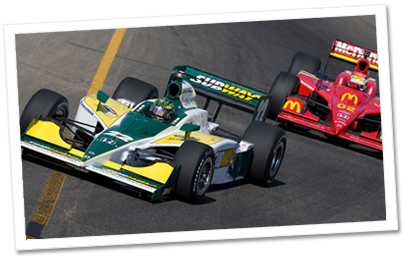 The challenge coincides with the release of an educational documentary, “SUBWAY® Restaurants: How a 17-year-old Built the #1 Restaurant Chain in the World through Franchising” by Young & Successful Media. 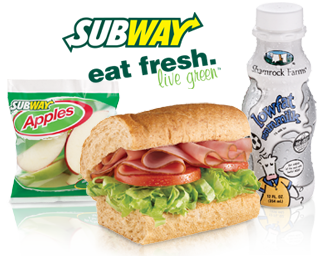 The SUBWAY® brand teams up with the Partnership for A Healthier America to encourage kids to eat more vegetables. For the second consecutive year, the Produce for Better Health Foundation (PBH) names the SUBWAY® brand “Industry Champion” for its dedication to the Fruits and Veggies More Matters message.